Lakota East Girls Swim/Dive finished 4th overall at this past weekends GMC Championships at Mason. At the GMC meet, we saw a true TEAM effort!! Lakota teams had 44 best times and dive totals including many great swims and dives. 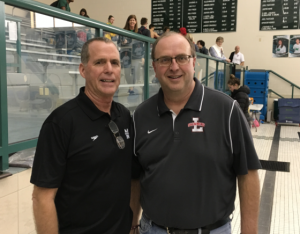 CONGRATULATIONS HEAD COACH DENNIS BECK FOR BEING NAME CO-GMC COACH OF THE YEAR FOR GIRLS SWIMMING WITH MASON’S MARK SULLIVAN!